For the past three years, House Speaker John Boehner has played the difficult role of trying to unify the Republican Party at a time when many Tea Party members have openly rebelled against any legislative compromise with Democrats. This week, Boehner attacked conservative advocacy groups for opposing a compromise budget agreement, which the House passed Thursday. “Frankly, I think they’re misleading their followers,” Boehner said, referring to the groups, many of which are allied with the Tea Party. 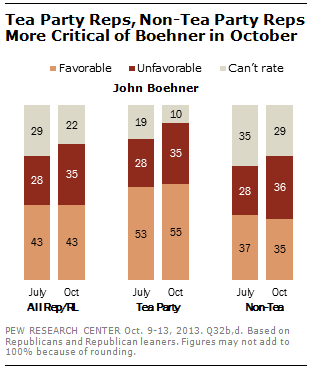 The Pew Research Center last polled on Boehner in mid-October, during the government shutdown and debt ceiling debate. By the time of that bruising battle, Boehner support’s among Republicans had dropped – among both those who support the Tea Party and those who do not. Since he became House speaker in December 2010, favorable opinions of him are virtually unchanged – 28% in 2010, 27% today. But his unfavorability rating rose by 25 points to 50% among the general public in October. Among all Republicans and GOP leaners, unfavorable views of Boehner rose seven points among those who agree with the Tea Party between July and October; the rise was comparable (eight points) among non-Tea Party Republicans. 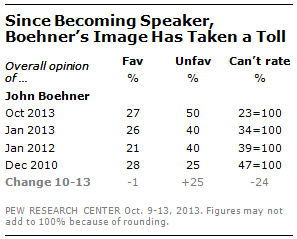 While Boehner’s overall image has become more negative since was elected House speaker, he is not alone in this regard. Unfavorable ratings of Rep. Nancy Pelosi, Boehner’s predecessor, rose by 28 points during her four-year tenure as speaker.